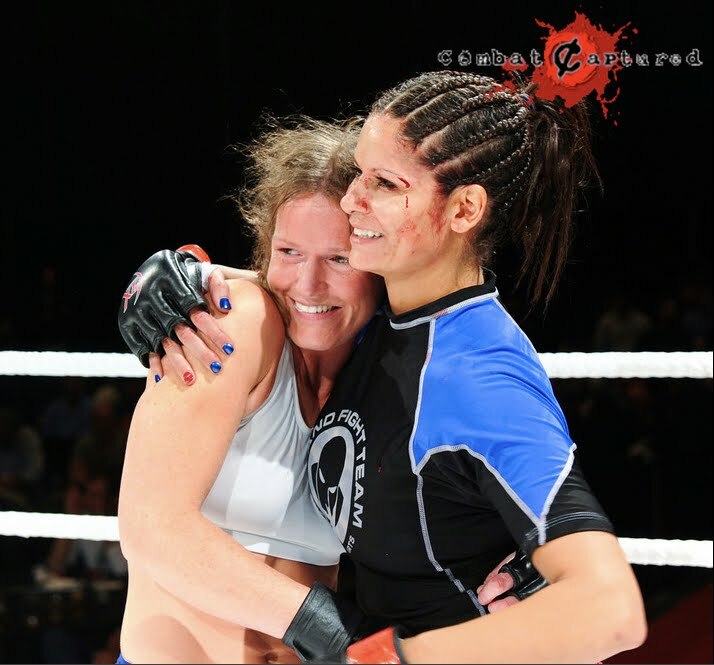 I am so excited and yet super relieved my fight is finally over with Kim Couture on AX: Combat "Execution" in Calgary on Friday night. Most important thing, I went in confident in the striking that I have been working on and getting better at every day. There were so many things that I am proud of in my match. It was so much fun coming out to the song "Surfin' Bird" and then for some stupid reason we always have faulty water bottles and I always end up getting it spilled or splashed on me by accident which I just find funny at the time. I wish I could have taken a picture of the crowd cheering me on after I won, it was the best feeling ever to look out and have so many people applauding my victory. I was not lying in my speech after my fight when they asked me what was next for me; I went to the Stampede and got me a corn dog. Yummers! The best part of the night was meeting Kim and hanging out with her after the fights at the after party and then we went to a Chinese Food restaurant and because it was Stampede the place was going crazy, people dancing on tables playing drums with their chop sticks. It was a great time and it was nice Kim could experience some Stampede action as well she got to see the Calgary parade and the Royal couple. My coaches were amazing (Brian, Doug and Brad). I love the focus and calm confidence they have for me in the back getting ready to fight even though I am sure they are nervous for me and putting on an act. No problem, I believed every second of it. The referee stoppage was controversial and I felt he stopped the fight too late but luckily in the end Kim was just fine. During the fight when I had the submission on I didn't know she was unconscious until her legs went flat. I was almost going to give up the choke thinking it wasn't on quite right. I will be back at Champion's Creed on Monday training again. We have such a great group of fighters and it is my turn now to be a partner for them after they helped me so much. Shooting guns and speeding boats, what could possibly go wrong with that?